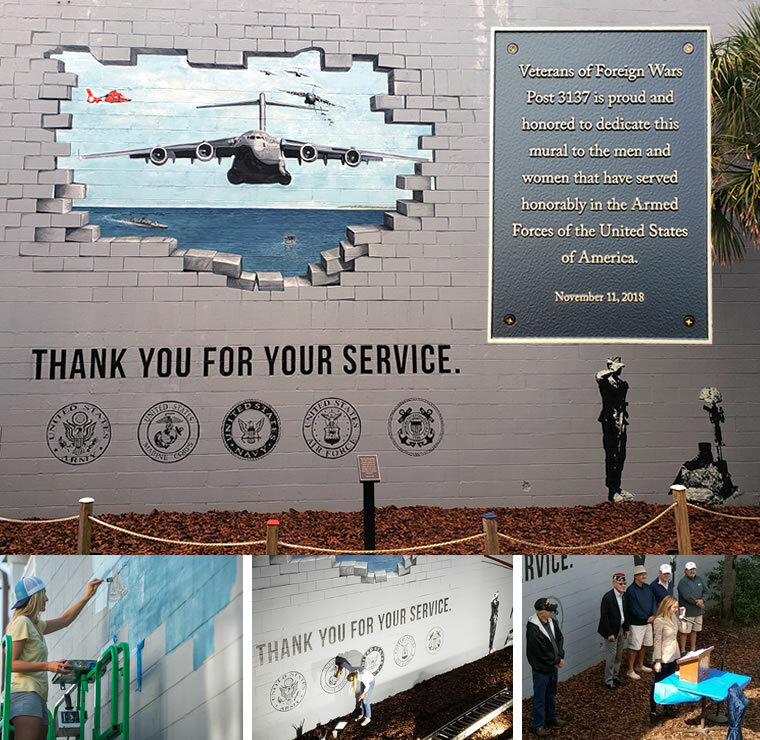 VFW Post 3137 dedicated our mural to all the men and women who honorably served. Post Commander Buddy Gillam presided over the mural dedication ceremony today and with Co-Chair John Bauer unveiled and recited the words from the commemorative bronze plaque (pictured above). Joining him for the presentation was the mural committee co-chaired by John Bauer and Dennis Hamilton and committee members Al Lowry and Eddie Spear. John Bauer’s grandson also read an essay he wrote on the meaning of Veterans Day to him. And most important our commissioned and very talented well-known local artist, Gretta Kruesi who took the committee ideas to incorporate elements and painted the stunning mural you see today. Her vision, dedication, passion and perseverance for the project was outstanding as she worked tirelessly to complete her mission for this day. Special thanks go out to Malcolm Burgis and the Windjammer for providing the canvas. Post Quartermaster Bo Stallings oversaw and coordinated logistics for the groundwork and securing a scissor lift, stand lights and the plaque mounting. The scissor lift was graciously donated by Sunbelt Rental for the duration of the project. Ground up lighting was installed by William Burgis so the mural remains lit for viewing into the evening. So many others contributed their time and effort in various capacities and we just can’t thank them all enough. In attendance were special guests, IOP Mayor Jimmy Carroll, city council members and members from all branches of the U.S. Armed Services. Many VFW members and guests of the post came out and a luncheon was provided immediately following the ceremony.